Chris Oemler recently shared this quote in one of her classes at the Leesburg studio. 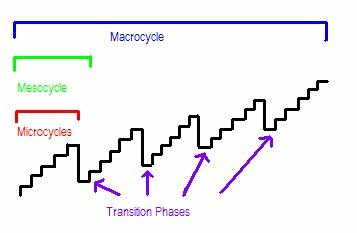 I often think of life in terms of training periodization cycles – here’s a very simple picture to visualize how training periodization works (simply put, purposeful waves). There are cycles of grinding and maxing out, testing your limits – but to grow and optimally perform, these challenging times must be followed my rest, relaxation, and recovery. In yoga, sports and life this occurs on macros and micro levels – the “micro” rest at the end of each yoga practice or the “down” periods (transition phases) in life (like having a nice Memorial Day week vacation!). These take the form of rest and reflection, allowing one to process absorbed knowledge and experiences, realize what you’ve even accomplished, and take a moment to learn from the past. If you push too far without this rest, hard work and training will be wasted; you risk injuring yourself, you burn out, and you simply become over-trained, not yourself and no longer engaged and benefiting from the process and practice. Of course, no surprise…like many of us do, I approached last week with ambitious intentions – the business plans I would write, the personal projects I’d complete, etc. Yet, the moment I finished those final exams and completed the long trek home…all I could do was sleep (and eat). Like myself, many of us are unaware how exhausted we’ve become. Three years ago, when I was forced to do nothing but think while recovering from my hip surgeries due to over-use injuries (something I never paused and stopped to do), I promised myself that I would intentionally plan time for this in the future. As stated earlier, this rest is essential for growing or else you burn out, or get sick, off-track, etc. and eventually are forced to stop. Often our greatest ideas, insights and intuitions come after we’ve taken a break – whether that’s meditation, a step away from the office, a walk, or vacation. Like a taper from training, at first, we feel ‘off’ or may question if we’ve even put in our best work…especially if we are letting ourselves rest. Was ‘my best’ good enough? Could I have done better? Will it pay off in the end? In sports and life, there’s uncertainty between the point of hard work behind us and not seeing results. However, along the way you trusted in this process, so shouldn’t you believe in the outcome? In sports periodization, after a week’s rest, our bodies hit a point where rest kicks in and our body can perform optimally. The accumulation of learning, work, and training experiences…and we realize “we still got this”…we’re on the right track. This “performance test” extends beyond a sport competition but comes in many forms – often life’s challenges, ideas or direction for what’s next. In training and in life, it’s hard to stay in your own lane, or even your own mat. We all have different goals – but we often get wrapped up in what is going on around us. There’s a balance to be found between surrounding ourselves with people who challenge and support us with while also maintaining focus of our own training strategy. It’s only after these tests you realize it was irrational to have ever worried or questioned yourself. This emotion of uncertainty or fear is purposeful – because without out any sort of discomfort, we would casually go about life, perhaps not attentive, without anticipation, never feeling the extremes, no satisfaction or appreciation. The following of a challenge or test of performance is an essential time to redirect our focus and make changes to the next cycle according to what’s working and what’s not working (and also what you may want to try experimenting). Whether you are approaching summer, a new job, the end of a school year, or any transition phase – it’s a great time to refocus and align with our goals. Remembering to rest, dreaming the life we want to live, following what we love, acting in alignment with our long-term goals, serving other’s, and fearing less. Amanda is a recent business graduate from Wake Forest University with her B.S. in Exercise Science from James Madison University. As Division I collegiate swimmer, life-long athlete, and entrepreneur – Amanda is an advocate of health and personal growth, on a constant pursuit to optimize life and inspire others through her commitment to healthy living. If you can’t find Amanda bouncing between projects, the gym, kitchen, her mat, or volunteering, you can find her online as she continues to lead and motivate others towards a happier and improved life through article contributions, newsletters and community motivation. (@amandapgraves, linkedin).